ISBN 9780825634833. 9x12 inches. Book/CD Pack. 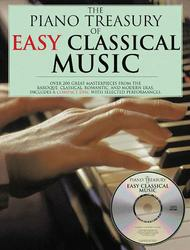 The Piano Treasury of Easy Classical Music is designed to be the cornerstone of your personal music library. This tremendous piano collection contains 400 pages of great music literature, specially selected and edited for thepianist who loves classical music. No other single volume can provide the wealth of exquisite piano selections contained within these pages. Here you will find the world's favourite inventions, preludes, fugues, minuets,sonata movements, nocturnes, waltzes, mazurkas, intermezzos, romantic short pieces, impressionistic works, and light classics, as well as the most rewarding traditional arrangements of themes from the great symphonies, chamberworks, operas, and ballets by the master composers of the past four centuries. book for the developing player. 61 of 91 people found this review helpful.